Dreaming of a white Samsung Galaxy S II, like the one hitting T-Mobile December 14th? The Samsung Galaxy S II has had quite an amazing year. To wrap up 2011, T-Mobile is offering the phone in white starting on December 14th. The specs are the same as what is found on the black version of the phone offered by T-Mobile. That means that instead of the 1.2GHz dual-core Exynos processor, you will find the 1.5GHz dual-core Qualcomm processor instead. The screen is a 4.52 inch Super AMOLED Plus display as opposed to the 4.3 inch screen on AT&T's variant. With a signed two-year contract, you will be able to pick up the white version of the Samsung Galaxy S II for $229.99. 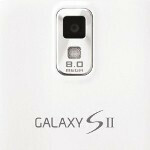 The information about the white Samsung Galaxy S II came from T-Mobile which sent out a tweet with the launch date included. This variant of the Samsung Galaxy S II is available only from T-Mobile's web site. can I just borrow the back cover from T mobile and put it on my Epic touch? I know thye are shaped slightly different, but maybe the back covers are identical. Only from Tmobile's site? Tmobile better put a discount on this phone after the holidays. At&t and Sprint has lowered theirs to $100 for quite some time now. I want this phone so bad but not gonna spend $900+ for four. Please Tmobile.